It’s no secret—I’m pushing thirty. Lucky for me, though, thirty is the new twenty. There has never been a better time to blow out thirty candles! But, if I’m being honest, turning thirty is a pretty big deal for me. As exciting as it is to put the student loans and self-doubt that defined my twenties behind me and step forth into a new decade, the thought of that big old 3-0 birthday rolling around still brings up some mixed feelings for me. A lot of my close friends also turned thirty earlier this year. Needless to say, I’ve spent a fair amount of time finding each of them a special gift that was worthy of the occasion; I would now consider myself an expert at shopping for thirty-year-old women (especially since I’m almost one myself). So, if you’re looking for the perfect birthday gift for that thirty-year-old lady in your life—whether she’s your sister, your gal pal, or your significant other—my advice would be to choose something that would help make the beginning of a new decade fun, meaningful, and, of course, a little indulgent. 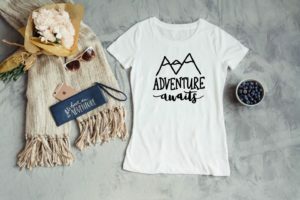 Here are some of the best 30th birthday gifts for her that’ll make any reservations she has about turning thirty disappear in a wisp of birthday candle smoke. I used to think that at twenty-five I’d finally start feeling like a grown up, but now that I’m in my late twenties, I can safely say that still hasn’t happened. I think the takeaway here is that even though the birthday girl is leaving her fun-loving, free-spirited twenties behind, she’s still, and always will be, young at heart. 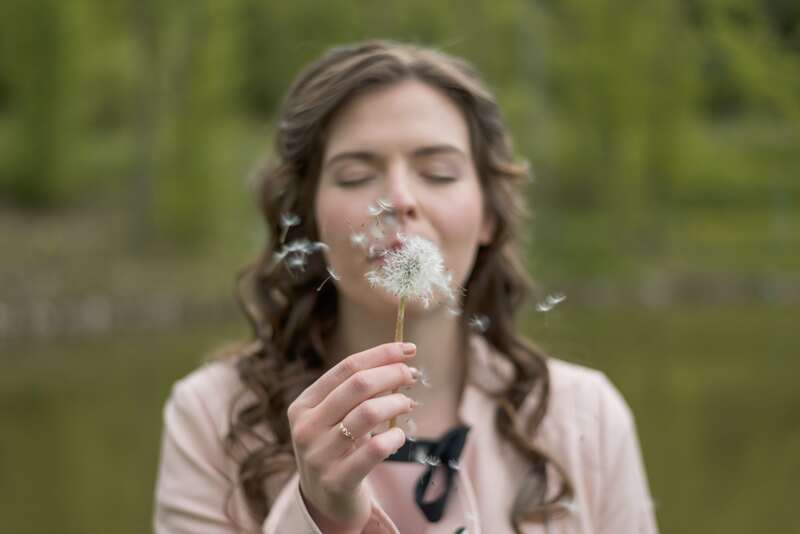 Giving a gift that celebrates her youthfulness is bound to be a huge hit—especially if the lady in question is feeling iffy about entering her third decade of life. A funny t-shirt: If the birthday gal has a stellar sense of humor, get her a cute t-shirt with a silly saying like “Forever 29” on it. Not only will she have a good laugh, it will help lighten the mood and remind her not to take the day too seriously. Plus, a top like this will make for some super cute Insta pics from the party, amIright? A gift certificate to a climbing gym: Monkeying around at a climbing gym will not only make her feel like a kid again, it will remind her of her youthful strength, agility, and adventurous spirit. And who knows, climbing could become a passion that will fuel her through her 30’s. A concert ticket to her favorite teen sensation band: I recently heard rumors that the Backstreet Boys are going on tour with—wait for it—THE SPICE GIRLS. Now, I don’t know if this is actually going to happen, but how rad would it be to treat your gal-pal to a night out dancing and singing along to the music that defined your teenage years? Start searching for shows near you now so you can snag floor seats and dance like it’s 1999! What I love about these fun gifts is that they remind the birthday gal that turning thirty doesn’t mean that she can’t laugh, play, and swoon over boy bands like she did back in the day. After all, you’re never too old to have fun. While I love a gift that indulges my youthful spirit as much as the next thirty-year-old gal, I’m also a fan of gifts that tug at my heartstrings and inspire me in some way. While books, jewelry, and art may not seem like the most creative of ideas, making them personal and specific to a girl’s thirtieth can add that touch of uniqueness. An inspirational book: For many, our thirties are a time for re-centering, seeking new inspiration, and finding deeper meaning in life. Books that inspire and uplift can help set a positive tone for the decade ahead. Some of my favorites include The Alchemist by Paulo Coelho and Jonathan Livingston Seagull by Richard Bach. Light Is the New Black by Rebecca Campbell is a must for a semi-spiritual, soul-searching birthday gal. 30th birthday bling: You can’t go wrong with jewelry at any age. But, when it comes to a thirtieth birthday, think in threes. 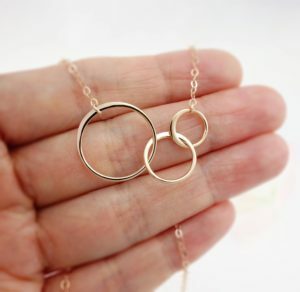 A ring with three stones or a simple rose-gold necklace with three interlaced circles symbolizing the three decades she’s celebrated makes for a precious keepsake. Every time she wears it, she’ll reflect on how far she’s come and use that to inspire her to keep moving forward. 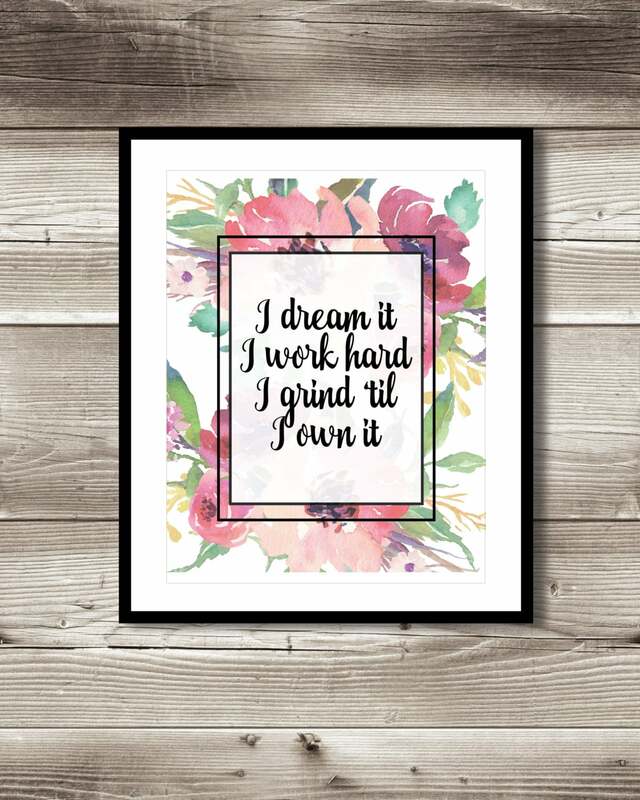 A motivational print: This makes a great gift for all those thirty-year-old girl bosses out there! 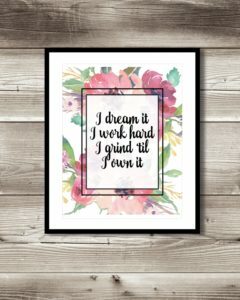 For my friend’s thirtieth birthday this summer, I got her a print with her favorite motivational quote (by Beyonce, of course) on a cute floral background to match her girly apartment decor. She hung it on the wall over her desk and looks at it every day to keep her focused as she works on her business. Don’t forget to include a handwritten note explaining the meaning behind your gifts. For my entrepreneurial friend, I wrote a little note on the back of her frame telling her how much she inspires me with all of her hard work. You can never go wrong with adding a personal touch! While traditional gift giving is always a hit, it can get to be a bit much—especially when all your friends are turning thirty within a couple months of each other. 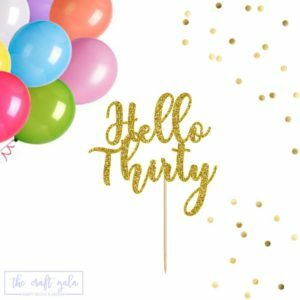 Why not spice things up this year by throwing a thirtieth birthday bash for all the birthday gals in your group and organizing a white elephant gift exchange? You’ll have hours of fun stealing each other’s gifts—and you’ll definitely feel like a kid again! To organize the festivities, you can use an online gift exchange program to set the theme, the date, and even the spending limit. It’s a great way to get everyone excited and keep everyone organized. Whether you’re looking for a gift for a friend or organizing a fun gift exchange for your thirty-year-old girlfriends, make sure you take the time to celebrate the birthday girl’s wonderful qualities, acknowledge how much she’s accomplished, and imagine all the exciting things that lie ahead for her. Of course, it also wouldn’t hurt to remind her every now and again that thirty is indeed the new twenty. For more creative birthday gift ideas, check out our For Her Gift Guide or start an online gift exchange for a fun twist on birthday gift giving. You can also connect with Elfster on Facebook, on Twitter @Elfster, or on Instagram @Elfster.